The adventures continue in this mid-fall week in the life of Yotsuba Koiwai, with adventures to a restaurant, a shopping mall, and a hot-air balloon festival in Yotsuba&! Volume 9. Note: Yotsuba&! Volume 9 is, of course, the sequel to Yotsuba&! Volume 8. The review of Yotsuba&! 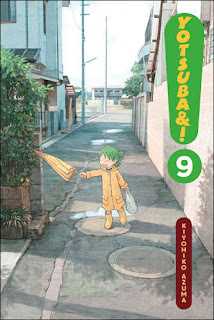 Volume 1 is here, and the review of Yotsuba&! Volume 8 is here. Otherwise, read on! Being a flowershop worker certainly seems to have some perks for Jumbo. A regular customer lets him know that Yuu Yuu (10/10) Yakiniku restaurant is having a half price sale on October 10th, and Jumbo reserves a tea room for four. Of course Koiwai and Yotsuba are coming, but things get really interesting when Yotsuba's nemesis Yanda gets invited as well. The drama gets turned up when Ena and Yotsuba disagree about what Ena's teddy bear is named. Juliet has been transformed to Jularlmin in Yotsuba's head, and unfortunately Ena isn't at all happy about the name change. Thankfully, an already planned trip to the shopping mall creates a happy solution to the situation. There's also a hot air balloon festival in the neighboring countryside, and the Ayase girls are going. So, of course, Yotsuba and Koiwai tag along too. And after a very sleepy start, the fun really begins. We get to see more of the side characters like Torako and Yanda, which is a nice addition to the standard folk. As always, this is a nice, gentle comedy that reminds the reader of being young. Highs: Will Fuka ever get her cup of coffee? Lows: Nothing in particular, actually. Verdict: Better than average for the series.